Think back to the world of the 1980s and 90s. Superheroes lived in comic book stores across America, and sometimes they made the leap to the big screen. Sometimes they worked, but mostly, they were cheap. They lacked the soul of the characters. The world evolved beyond these. We live in a world now that has the Marvel Cinematic Universe. It has movies like Logan and Shazam! and Wonder Woman. Movies that take these worlds and breath life into the pathos we can read on paper. They take the source material and give it legs. They respect it. This is where the new Hellboy immediately stumbles. 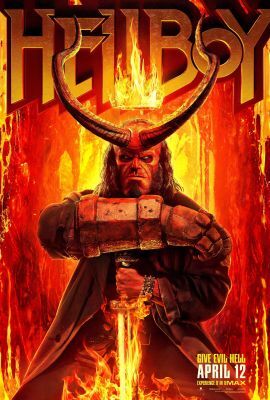 Starring David Harbour, the new movie based on the comics by Mike Mignola sees Hellboy, the world’s greatest paranormal investigator, kind of fed up with his life of being a living weapon for the BPRD. When forced to confront Nimue the Blood Queen (played by a wooden Milla Jovovich), he is thrown down an unending rabbit hole of twists, turns, and bonkers set pieces that never quite connect but which sometimes show promise. The film takes a blueprint from the source material, but then makes radical alterations that don’t add up even if we’re not making one-to-one comparisons to its basis. Elements like The Wild Hunt, The Osiris Club, and Hellboy’s origins are nearly the same here as in the comics, but certain characters are hollow shells of who they could be. The cast works with what they have, which is clearly not a lot. Harbour, who does a decent job behind all that prosthetic make-up, can’t outrace the urge to scream half of his lines, a tactic which becomes grating the more it happens. Sasha Lane, a standout in the incredible American Honey, is stale throughout and Daniel Dae Kim is almost completely wasted in a role that could have been cut from the film with no noticeable change. Ian McShane, who appears on screen to cover the movie’s many moments of exposition, is just Ian McShane wandering onto the set and speaking; it’s not even a performance as it is an actor just being present. There’s an even more distracting thing about the performances in the movie and it’s the sheer amount of poorly ADR’d dialogue, mixed at different levels from the other sounds and standing out like a big red devil in a Mexican wrestling ring. 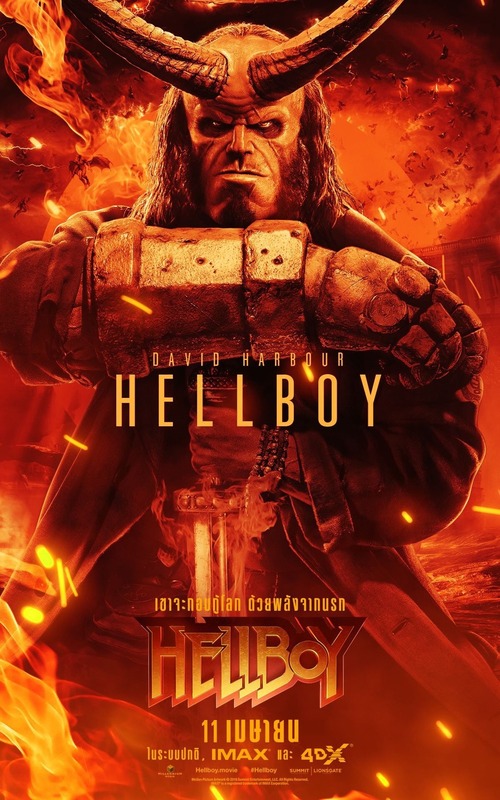 In the same way that the movie at least attempts to tell a story about Hellboy finding his own identity, this is a movie that can’t seem to figure out what it wants to be. The recent Aquaman was made as almost a carbon copy of childhood memories of Saturday morning cartoons (resulting in a deep fried cheese ball injected with ham); comparatively, Hellboy wants to smash its cake and eat it too. The film feels like a blend of schlocky direct-to-video fantasy movies and gross-out animation like Ren & Stimpy. It’s a combo that doesn’t make sense, and only sometimes works. There’s another popular superhero movie that we can point as influencing this new Hellboy and that’s Deadpool. Harbour embodies the character in a lot of ways, but making references and dropping F-bombs won’t suddenly elevate this material to Merc with a Mouth levels, and doesn’t feel natural either. There’s also a meanness at play that feels out of tone, if there was even a central tone to be established at all. Hellboy the character doesn’t know what kind of man he wants to be, and the story is poorly served because he’s in a movie that wants to be other movies instead of its own. The film isn’t entirely a loss though. There are individual sequences and moments that work, various beats of Harbour’s Hellboy that feel perfectly in character. Some of the comedy bits are laugh-out-loud moments that feel ripped from the comic pages, but they are few and far between. Hellboy meeting with The Osiris Club might be the best piece of the whole thing, and if removed from the confines of most of the rest of the movie would make for a great live-action version of what the world of Hellboy is like: dark, brooding movies with Gothic settings that have a bright red goofball thrust into them. Other moments like Thomas Haden Church’s Lobster Johnson and a truly random zombie battle in the woods work as individual vignettes, but add almost nothing to the overall flavor. The creature designs are also aces, but get brought down by distractedly bad visual effects at times. Director Neil Marshall has a history of making over the top and outlandish movies. The Descent and Dog Soldiers show he can take high concepts and deliver satisfying entertainment, but that same thrill and through line isn’t present here. Even Doomsday, a complete schlock-fest, has the presence of mind to know what kind of movie it is and the foundation it’s built on. Hellboy seems lost in a haze entirely, a series of scenes strung together with barely a path to guide them. The new Hellboy wouldn’t be so bad if it wasn’t so boring and ugly to look at. Moments that happen just for the sake of moving the plot could be forgiven, but its garish visuals hinder it and its plodding plot doesn’t come together in any satisfying way. It’s disappointing to see the same mistakes made thirty years ago with superhero movies being repeated in such grandiose fashion — especially when it falls flat on its face teeing up a sequel that will be banished to hell. The post Hellboy Review appeared first on ComingSoon.net.